A tank biathlon is a mechanised military sport developed by the Russian military with some similarities to the winter sport of biathlon. It utilizes the complex training of tank crews including their rough terrain passing skills combined with the ability to provide accurate and rapid fire while performing maneuvers. Participating tanks drive a three-lap route of 6–10 km. During the first lap, crews fire at targets positioned at distances of 1,800, 1,700 and 1,500 m. In the second lap, different targets imitating an anti-tank mortar (RPG) squad and an infantry unit are fired upon. These targets are at a distance of 600–700 m, and must be engaged with a 7.62 mm coaxial machine gun. In the third lap the tank crews targets a target shaped like an anti-tank gun and ATGM unit by use of the turret-mounted heavy machine gun at a distance of 1,200 m. One or more misses leads to an extra penalty lap of 500 m long. On the final lap tanks have to go through various terrain obstacles; an obstacle missed or improperly traversed adds 10 seconds to the crew's final timing. The United States received an official invitation in 2013 and an unofficial invitation in 2017. In 2014, 41 countries received the invitation. The first international tank biathlon competition was held at the Alabino proving ground in the Moscow Oblast, on 12–17 August 2013. Four teams took part in the competition: Russia, Armenia, Belarus and Kazakhstan. The 1st Tank Biathlon World Championship (2014 Tank Biathlon World Championship) took place at the Alabino proving ground on 4–16 August 2014. Out of 41 nations that received invitation to the tournament, 12 sent their representatives. Every competitor (except Teams China and Russia) received a T-72B tank in the biathlon color scheme. Team Russia piloted the newest modification, T-72B3, and Team China brought their own Type 96A. Russian preliminaries for the event ran in several of military districts of Russia. Each district sent its top crews to compete for the Cup of Russia, and 3 finalists from that event formed the national Team Russia for the World Championship. Participating nations also held preliminaries on their own, sending 3 top crews and a reserve crew accompanied by maintenance and repair personnel to Russia. The final competition was a relay race, the top 4 teams fielded all their crews taking turns. The second event of the series took part on 1–15 August 2015 at the same venue in Alabino. 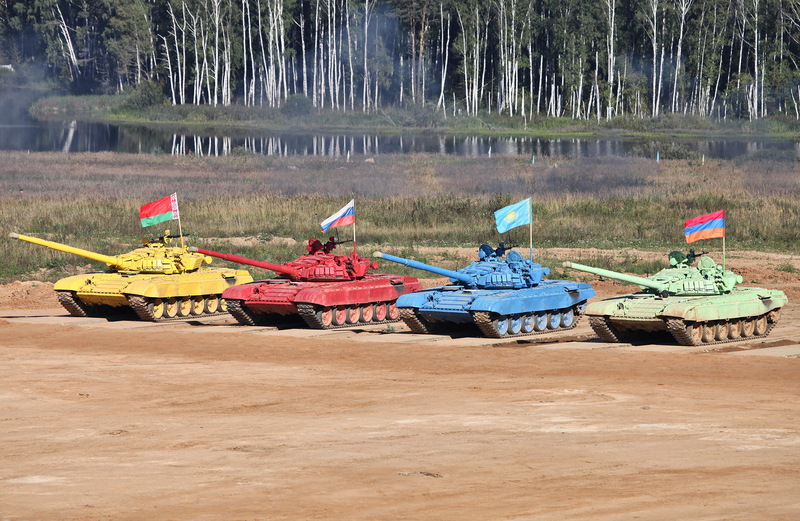 This year the Tank Biathlon was held as a headliner of the ru (2015 International Army Games) that included similar competitions for all things military, from artillery (Masters of Fire) and air force (Aviadarts) to field kitchens. The athletic stage for the crews was removed from schedule. Veteran of both previous events, Team Belarus decided to participate in the Army Games "only in the disciplines where we are absolutely ready" and thus didn't apply for the Tank Biathlon (after finishing only 5th last year). Consequently, Belarus won 3 gold, 50 silver and 249 bronze awards and finished 3rd in the total medal score of the Army Games, being surpassed only by Russia and China. The Nicaragua and Tajikistan national teams joined the event for the first time. All teams were piloting upgraded T-72B3 tanks, excluding Team China which continued to field its own Type 96A. The third Tank Biathlon took place in Alabino as part of the 2nd International Army Games (2016 International Army Games) on 30 July–13 August. The fourth Tank Biathlon took place in Alabino, Moscow Region. Most counties uses same type of vehicle as previous year such as T-72B3 and Type-96B with the exception of India fielding with T-90 Bhishma. New Delhi Television reported that the Indian Army felt disadvantaged using T-72B3 tanks provided by Russian in 2016 and was keen to field its best tanks and best crews in 2017. However, As a result of the malfunction of both T-90 tanks including the reserved one, the Indian squad was unable to complete the race and were disqualified before 1/2 final. After seven days of contests, Team Russia won 11 gold, 5 silver and 4 bronze awards and finished 1st in the overall ratings, and Team China achieved second place with 7 gold, 2 silver and 2 bronze. ↑ "Сергей Шойгу сделает танковый биатлон новым видом спорта" (in ru). August 10, 2013. http://www.vesti.ru/doc.html?id=1116256. Retrieved August 12, 2017. ↑ Rogoway, Tyler (June 7, 2017). "Russia Challenges U.S. Tankers To Compete In Its Annual "Tank Biathlon"". http://www.thedrive.com/the-war-zone/11253/russia-challenges-u-s-tankers-to-compete-in-its-annual-tank-biathlon. Retrieved August 12, 2017. ↑ Kramnik, Ilya (May 19, 2016). "Гонка танковых чемпионатов" (in ru). https://defence.ru/article/10689/. Retrieved August 12, 2017. ↑ Ptichkin, Sergey (August 13, 2016). "Международные армейские игры завершились победой России" (in ru). Rossiyskaya Gazeta. https://rg.ru/2016/08/13/mezhdunarodnye-armejskie-igry-zavershilis-pobedoj-rossii.html. Retrieved August 12, 2017. ↑ "After Both Tanks Break Down, India Knocked Out Of International Drill". NDTV. http://www.ndtv.com/india-news/after-both-tanks-break-down-india-knocked-out-of-international-drill-1736699. ↑ "India knocked out of tank contest in Russia after T-90s develop snags". Hindustan Times. http://www.hindustantimes.com/india-news/india-knocked-out-of-tank-contest-in-russia-after-t-90s-develop-snags/story-TQRNInKysug3ATwr7PK1MM.html. ↑ 7.0 7.1 "Result of contests 2017" (PDF). International Army Games. http://armygames2017.mil.ru/results_of_contests_en. (Russian) Official site of the project. Official video of the competition. All 5 issues for each year (you need to switch from a button on the site to video hosting (the list 1 ~ 5 will open)).